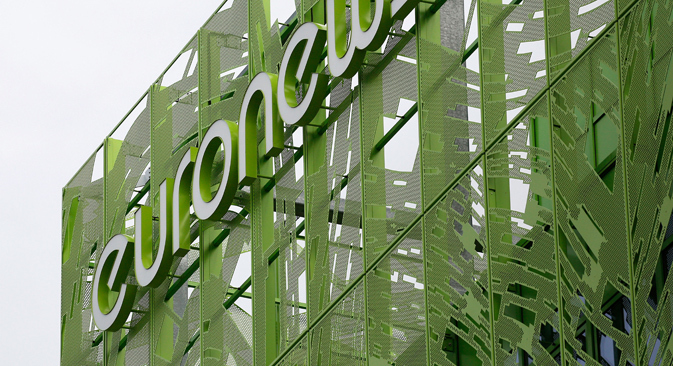 The new headquarters of Euronews television, the multilingual European television news, are seen in Lyon, central France, Sept. 22, 2015. Court freezes assets in support of former shareholders of defunct oil firm. The 7.5-percent stake in Euronews is owned by the Russian state broadcaster VGTRK, the website RBK has reported, citing a Russian federal official. The press service of VGTRK confirmed this information. Euronews spokeswoman Sophie Bourgin declined to respond to a request by RBK for comment. Director of GML (formerly Group Menatep Ltd) Tim Osborne, representing former shareholders of Yukos, was unavailable for comment on Oct. 28. The seizure of shares owned by the Russian state holding had no effect on the activity of either Euronews, or VGTRK, according to a source close to the French broadcaster. But a partner of the law firm King & Spalding, Ilya Rachkov, noted that the seizure of assets is "at least the inability to dispose of the shares, i.e. to alienate them, transfer the right of property." Rachkov confirmed that seizing assets is relatively straightforward, but can be appealed against. VGTRK became a shareholder of Euronews in 2001, buying a 1.8 percent stake in the company. The Russian business daily Kommersant estimated the deal at $250,000 at that time. Later in the same year, Euronews began to broadcast in Russia. In 2004, the share of VGTRK in Euronews rose to 16 percent. The Russian state holding spent about 3.5 billion euros on the increase in its stake, Kommersant reported. In 2014, the former shareholders of now-defunct oil company Yukos, which was controversially broken up by the state in 2003, won lawsuits against Russia at The Hague and the European Court of Human Rights. The court in Strasbourg has ordered Russia to pay them 1.9 billion euros ($2 billion), and the Permanent Court of Arbitration in The Hague – more than $50 billion. Russia did not agree with these decisions. In the summer of 2015, the former owners of Yukos started the process to recover the money awarded to them in the courts of Europe and the United States. In June, Belgium and France seized Russian assets in connection with a lawsuit filed by the former owners of Yukos. The Kremlin vowed to challenge the seizure of assets.